Deniz Melanlıoğlu graduated from Kırıkkale University School of Arts and Sciences Turkish Language and Literature department in 2002. She has completed her doctorate degree in 2011 in Gazi University. 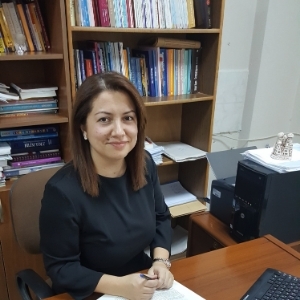 She has worked as an assistant in Kırıkkale and Gazi University between 2002-2011 and has taught Turkish Language to foreigners in Gazi TÖMER. She has become an assistant professor in 2015 and worked as a visiting lecturer in Cemal Biyedic University in Bosnia and taught classes such as Turski Jezik, Fono – Taktične Vježbe, Pisanje Na Turskom Jeziku, Metodika Nastave Turskog Jezika. She has contributed to several books as an author and editor. She is currently an associate professor in Kırıkkale University’s Literature Faculty.